During her performing years, the beautiful and talented Pinito was a favorite among photographers and circus press agents. Many photos of her are in circulation today as collectors items. "Pinito del Oro" was born Cristina María del Pino Segura on Nov. 6, 1931 in Las Palmas, Canary Islands to parents José Segura and Atila Gómez Segura. Cristina was the youngest of the 19 children, who were all circus performers. Pinito began performing at age nine with her father's circus in Spain. 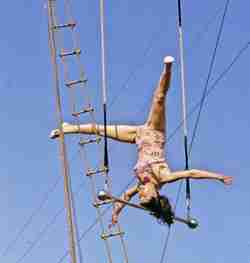 Her first act was walking the tight wire, her older sister Esther was the featured aerialist of the show. 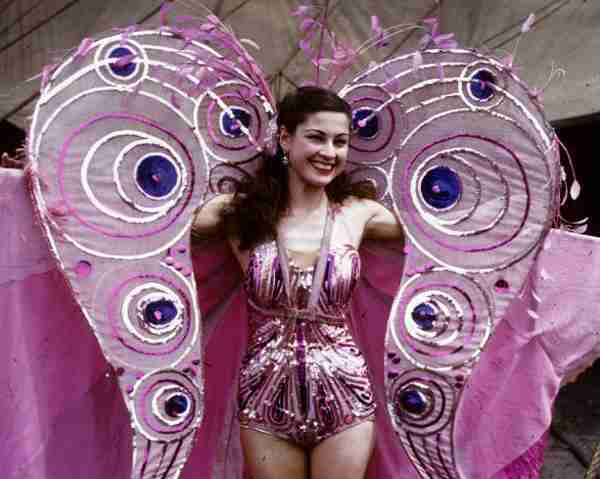 In 1943 as the circus was moving from Cadiz to Seville Spain, Esther was killed when a show truck overturned. 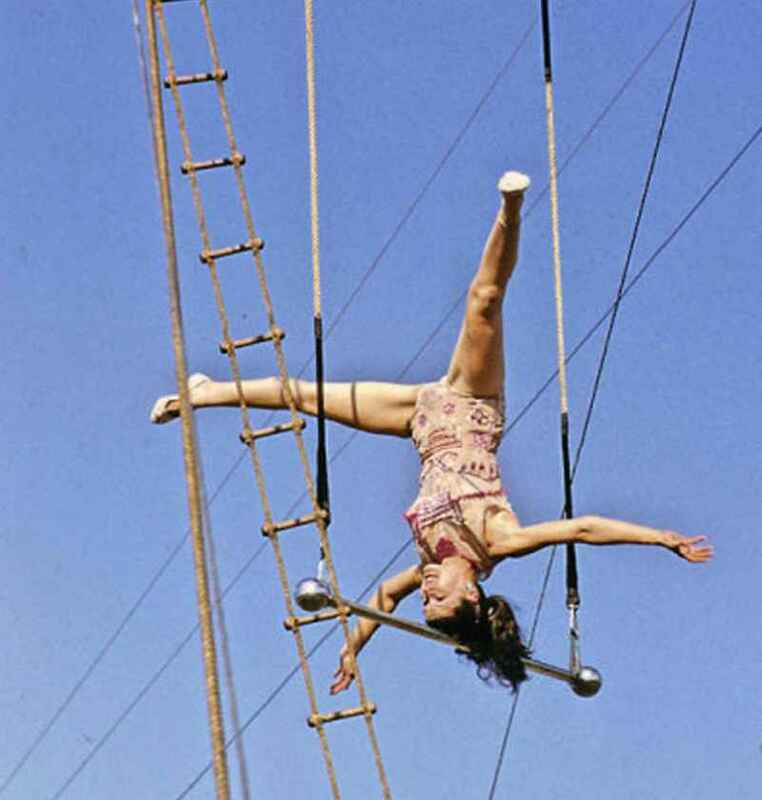 At age twelve Pinito took over her sister's role on the high trapeze. In 1949 while performing with Diaz Bros. Circus in Valencia, Spain, Pinito was discovered by a talent scout from the Ringling Bros. and Barnum & Bailey Circus, who offered to hire the young performer. In 1950, Pintio came to the United States and began working with the RBBB as a featured aerialist. She continued to perform with the RBBB until 1956. After seven seasons of staring on the Ringling Bros. and Barnum & Bailey Circus Pinito returned to her beloved Spain. Her name had now become famous throughout Europe. For the next two years she toured the continent as the featured attraction on Europe's largest circuses. On April 28, 1958 while performing with Cirkus Scott in Stockholm Sweden, Pinito suffered a fall in which she fractured both wrist and received a serious laceration above her right eye. Pinito recovered swiftly and was soon performing again. In 1959 Pinito returned to the United States and performed for the Clyde Beatty-Cole Bros. Circus. For years Pinito del Oro had put aside money with the dream of opening a hotel in the Canary Islands. In 1960 she fulfilled her dreams and opened her hotel at Las Palmas. Due to her popularity, her inn keeping days were short lived. She was persuaded to return to the center ring and once again began staring in European circuses. Pinito continued performing until 1970, then retired to her home in Las Palmas. In 2014, Pinito Del Oro was inducted into Sarasota's Ring of Fame, Pinito unfortunately was unable to attend. Speaking on her behalf were fellow performers La Norma Fox and Kenny Dodd. Pinito's nephew Raul Segura accepted the award on her behalf. Cristina María del Pino Segura "Pinito del Oro" passed away October 25, 2017, she was 86 years old. On January 19, 2014 Pinito del Oro was inducted into the Sarasota's Circus Ring of Fame. In 1990 Pinito del Oro won Spain's National Circus Award. In 1990 Pinito del Oro was inducted into the Circus Hall of Fame. In 1998 Pinito del Oro received Spain's Gold Medal of Fine Arts.